So you thought the bosses in Dark Souls were hard? Ha! That's adorable. 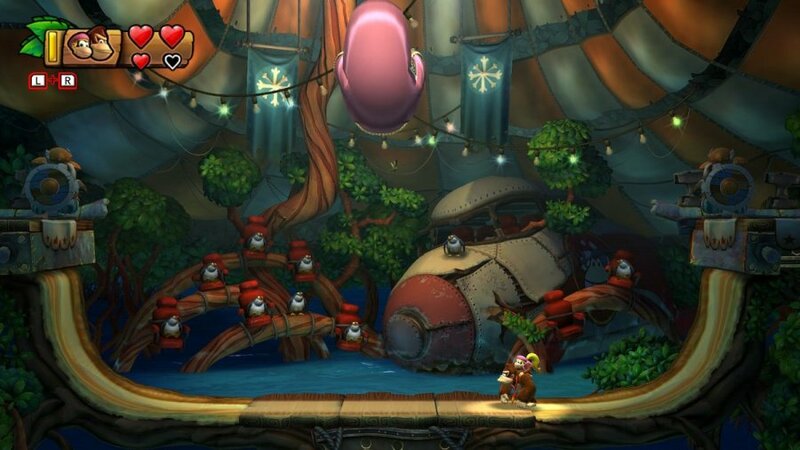 You clearly haven't fought a Donkey Kong Country: Tropical Freeze boss just yet. 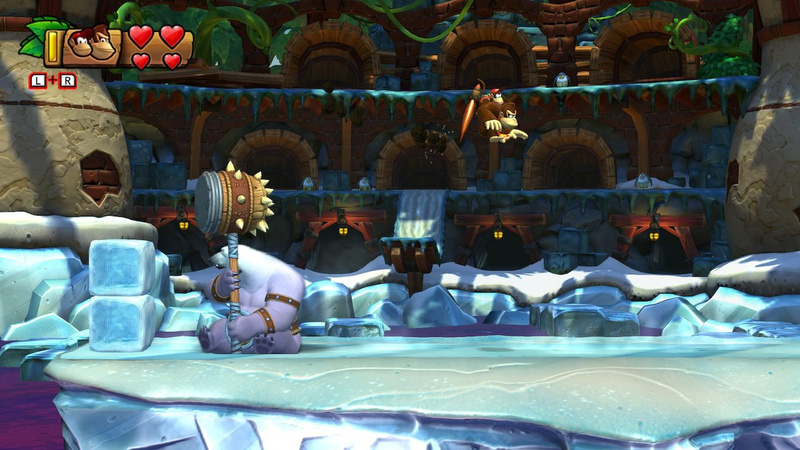 Okay, in all seriousness, the bosses in Tropical Freeze are pretty tough, and require the very best of your reflexes and memory to beat – much like in Dark Souls. Each boss does have an attack pattern, and once you've learned it you can typically beat them unscathed. Each boss also has three attack phases too, and requires the same number of hits so you'll always know how close you are to the end. The problem is, it all requires an awful lot of trial and error that can eat into your free time. If you don't have any, or simply can't be bothered, don't fret! We've beaten all of the bosses in the game for you to bring you this guide on how to do it yourself. 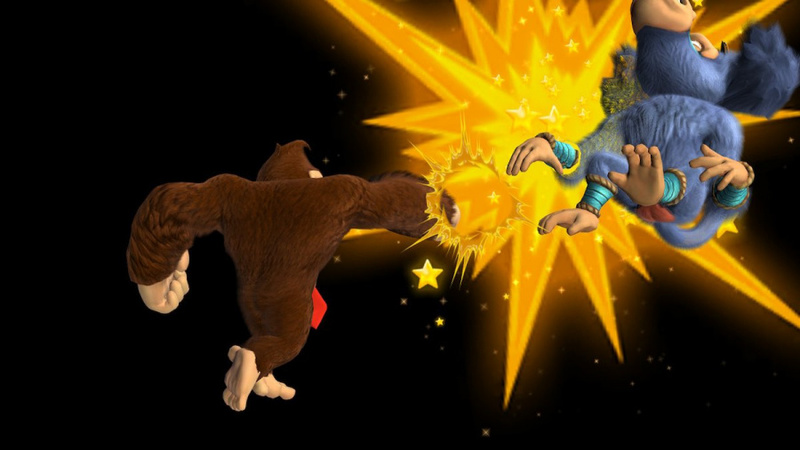 We'll go over attack patterns, strategies you can adopt, and preferable Kong buddies if there are any. Let's get right to it. This boss is a giant seal that will slide back and forth across a half pipe, attempting to hit you along the way. To damage it, you have to bounce off its back while it's sliding, and this requires good timing so you don't take damage or miss it entirely. Each time you hit the seal during this phase, it will throw stuff at you. At first this will be harmless fish that will just flap around for a bit, but it can be spiky sea urchins. You can bop off the fish to get rid of them, earning items (including hearts) as a reward, but you the sea urchin will hurt you. Just avoid it. During the second phase, the seal will periodically switch between rolling at you, and sliding at you. Stay patient, and avoid trying to hit it when it's rolling because you'll take damage. Wait for the slide and hit it as usual. Once hit, our seal friend will summon penguins to attack you. They can appear at any point on the half pipe so keep an eye out and jump on them when they appear. Eventually, the seal will attempt to stomp on you. Just avoid it and it will stun itself, allowing you to attack it safely. Rinse and repeat until phase three. For phase three, you'll have to contend with sliding penguins and the seal. Bounce off them and await your opportunity to jump on the seal's back as before. Once damaged, the seal will chuck bigger fish and sea urchins at you. Dodge the urchins as usual, but be careful with the big fish. These guys can take a hit, and will take three of them in total to bring them down. Fortunately, they are slow so it shouldn't be too much trouble. Again, the seal will try and stomp you but this time it will make several attempts. Keep dodging them until it's stunned then jump on its head. Rinse and repeat and you're ready for world two! The first phase of Mountaintop Tussle is pretty easy. The owl will chuck a series of knife-like feathers at you that you can easily avoid. Then there are spiky ice balls that fall from above. Just roll out of the way. Finally, you'll have eggs thrown at you as a last-ditch effort. When these hatch, bop on the baby owl, pick it up, and jump up the two platforms on the right or left (whichever is closest to the owl) and chuck it at the owl to damage it. Rinse and repeat these instructions two more times and a barrel cannon will appear that will blast you to phase two. During the second phase of Mountaintop Tussle, you'll have wind to contend with. 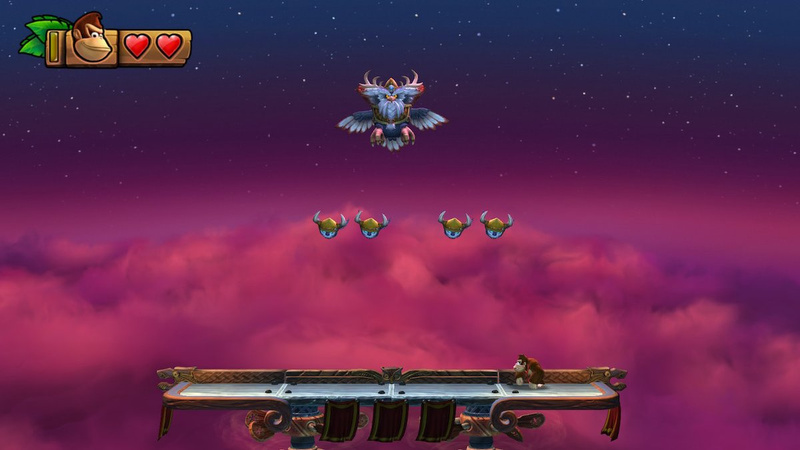 Move against the wind so you don't fall off the platform, and avoid the enemies that occasionally fly out at you. Eventually, an egg will appear. Just like in the first phase, bop on it, pick it up, and chuck it at the owl to damage it. 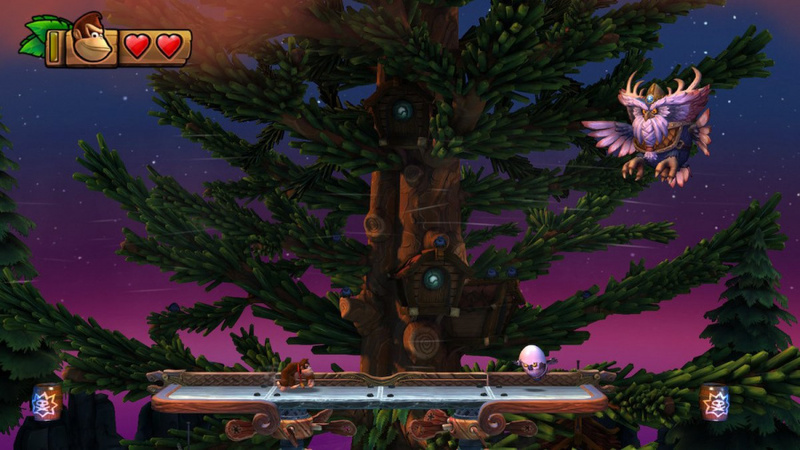 The owl will then fly from one side of the screen to the other, dropping feathers on its way. Roll in the direction the owl is moving to avoid them, and jump into the barrel cannon at the end. 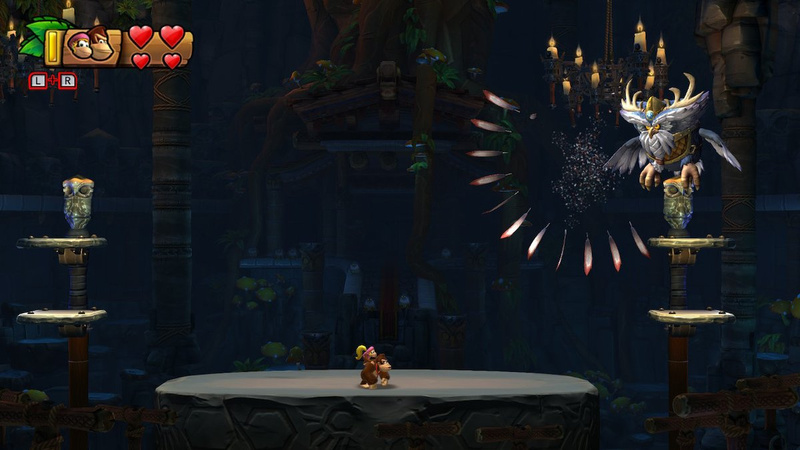 You'll blast safely back onto the platform, avoiding the feathers. It should drop another egg then, that you can pick up and chuck at the owl to damage it. Do so one more time and you're onto phase three. Phase three will begin with more of those pesky feathers. Dodge them as you did in the first phase, but bear in mind that they do land a lot faster this time. Following this, you'll have to avoid waves of little owls. 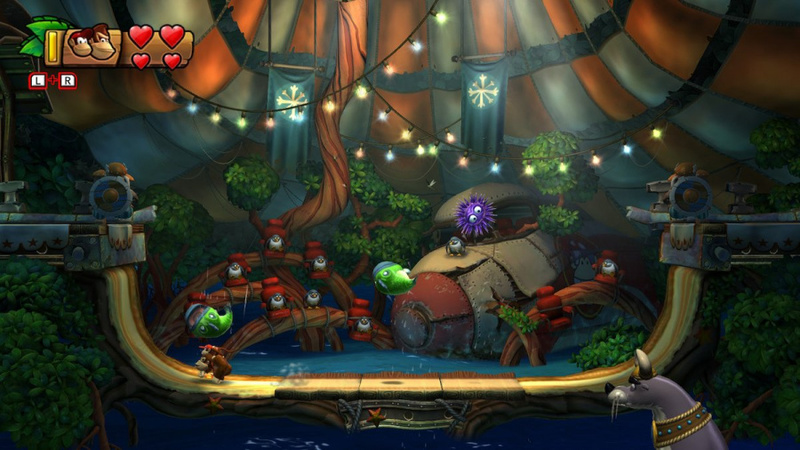 Keep an eye out for any wearing eggshells and do as you do best – bop 'em, pick 'em up, and chuck 'em at the big owl when he floats down to the lower portion of the screen. Next you'll have to dodge a bunch of giant eggs that release nasty little spiky owls. Dodge the eggs and eventually the owl will fall to the platform dizzy. Bop it on the head. Following this you'll have a bunch of ice balls thrown at you – dodge them then repeat the phase one more time to defeat this boss. 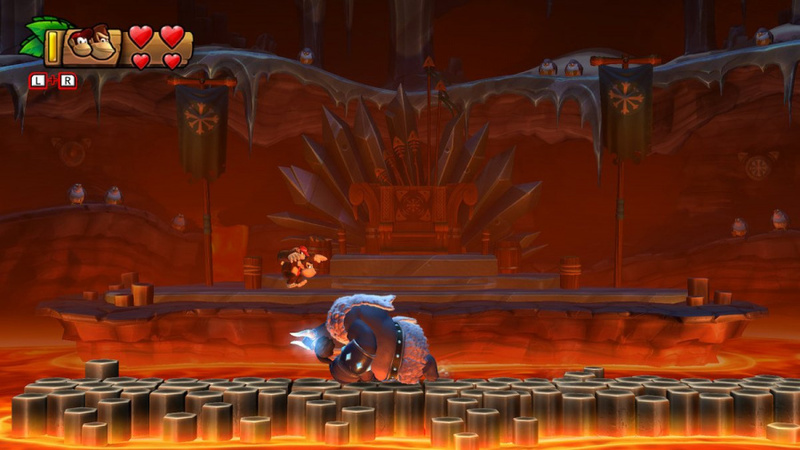 As the name suggests, this boss is actually made up of three monkeys you have to defeat. 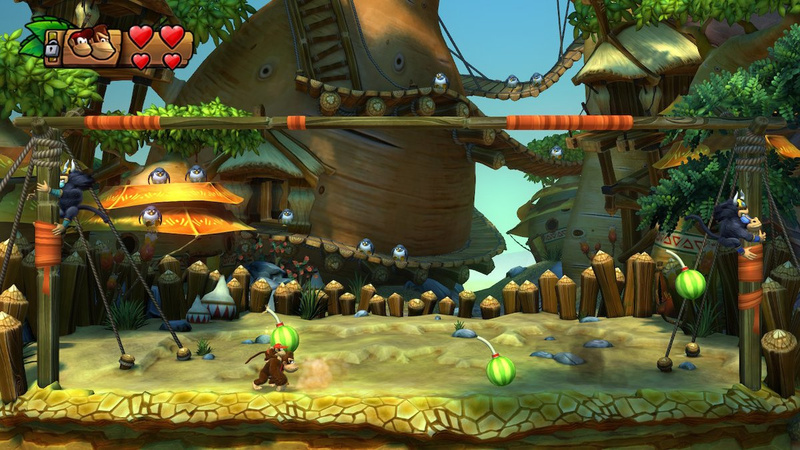 During the first phase, they'll take it in turns swinging at you – some with hammers, some upside down in a silly pose. Stay well away from the hammers because you can't duck under them. Bounce off the monkey performing a silly upside down pose to hurt it. Keep doing this until they get mad and drop down to try and attack you. Dodge their attack rolls until they ram into a wall and stun themselves, at which point you can bop them on the head. Rinse and repeat this section until you defeat a monkey and enter phase two. Phase two will begin with the two monkeys chucking bombs at you. Avoid the spiky red ones and wait for a watermelon bomb to appear. Grab it and chuck it at the nearest monkey, but make sure it isn't hiding behind the pole or you'll miss it. Keep repeating these stops until the baboons once again drop to the ground. Now, just avoid the monkeys as they try and jump on your head until one of them stuns itself. Bop on its head and repeat this section until they head back onto the wooden frame. Revert back to the first paragraph of phase two until you're left with just a single monkey, triggering phase three. At the beginning of phase three, the annoying monkey will summon its two friends back from the dead as ghosts and they'll form a chain of monkeys that swing at you, chucking bombs. Avoid all red bombs and the monkeys, then grab the watermelon bomb and chuck it at the chain. They'll then revert back to a tougher version of their phase one pattern, except adding bombs to the mix. 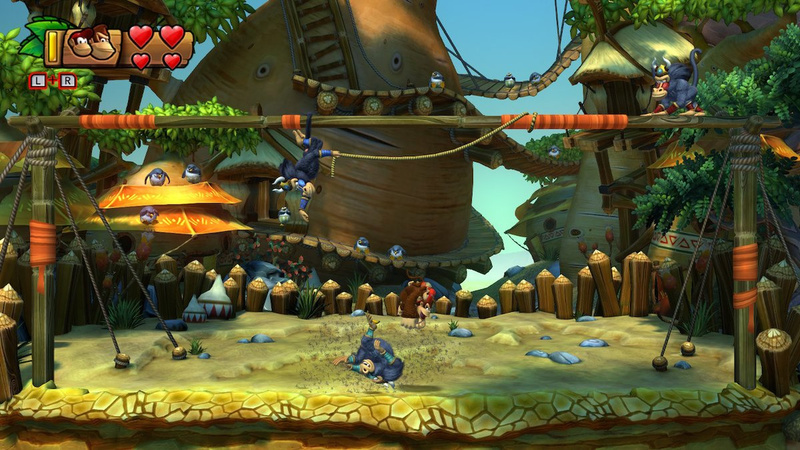 Avoid literally everything while keeping an eye out for the main monkey to swing upside down. Bop that naughty monkey. Now, the monkeys will revert to the big chain from the beginning of phase three. Avoid all of those red spiky bombs until you see the watermelon bomb. 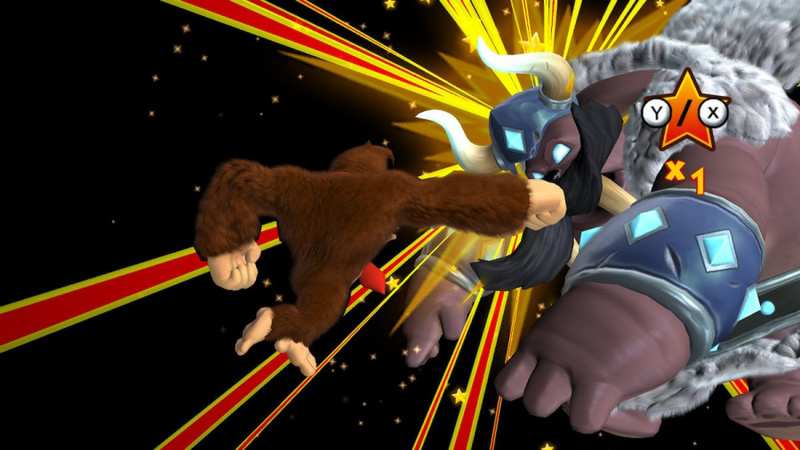 Grab it and chuck it at the real monkey to end this battle. This is probably the toughest boss battle yet, primarily because you're in water for the entirety of it. Oh well. The first phase involves swimming away from the pufferfish when it inhales air, then swimming towards it when it exhales. Basically, just do everything it takes to avoid all of the spikes around the edge. Eventually, the nasty pufferfish will start spinning around, exposing its soft white stomach. Dash into this to hurt it, but be careful to avoid all of the deadly spikes. The pufferfish will now repeat this once again, except it will release little fish at you when it exhales. 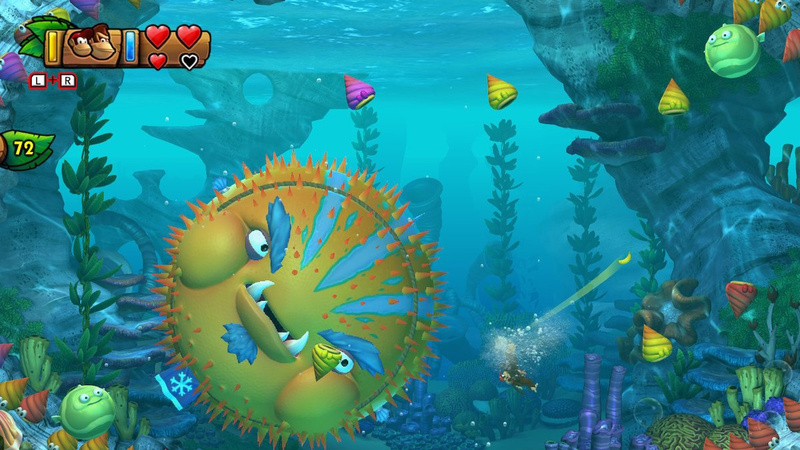 Dash into one of them while facing the pufferfish to launch it at it, causing more damage. This will force its spikes to retract, allowing you to hit it for a third time, triggering phase two. Our pufferfish friend will now try and roll into you, but it's pretty easy to avoid it by going above or below it – wherever there's a gap. Now, it will do that inhale/exhale attack again, but this time releasing spiky enemies at you. 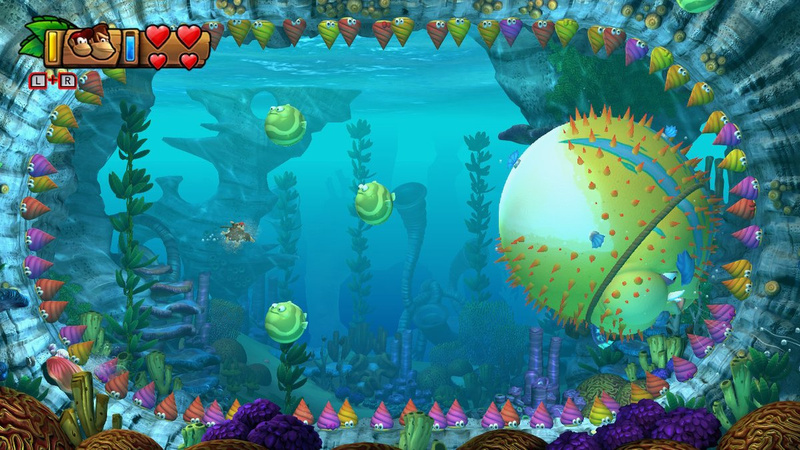 Avoid them and the spikes on the wall until the pufferfish starts diagonally flinging itself around the arena. Hit it in the stomach to damage it. 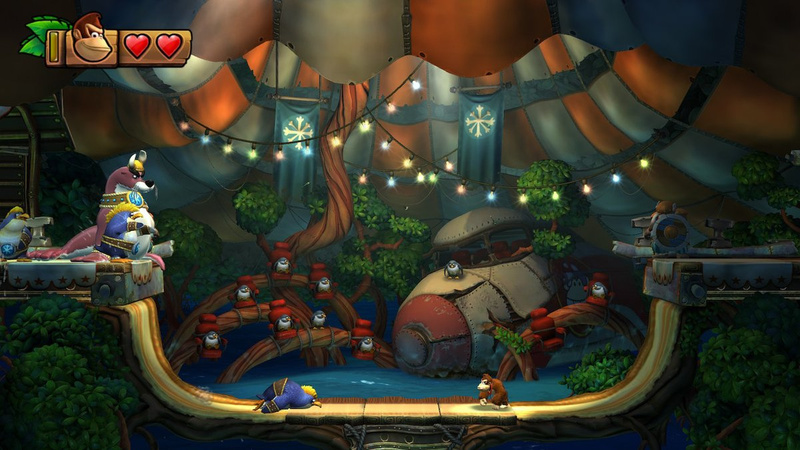 This causes the pufferfish to spin around the arena. You can hit it during this phase, but you'll have to be super careful to avoid the spikes. If you don't, you can just rinse and repeat what's come before. This time though, you can hit enemies back into its face like during the first phase. 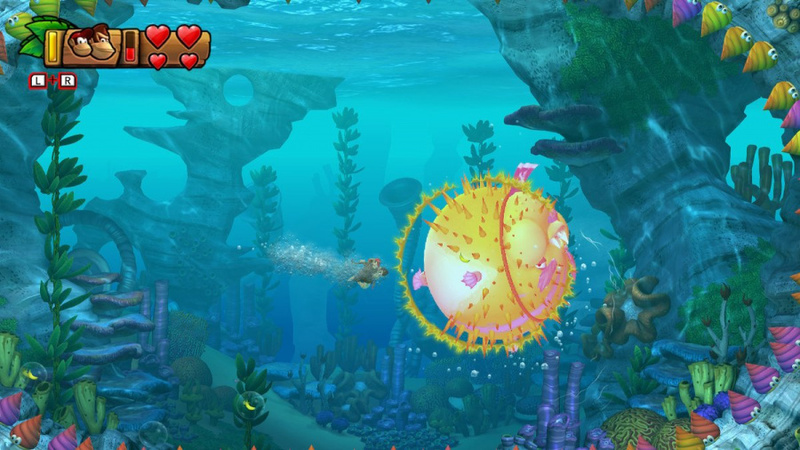 At the beginning of phase three, the pufferfish will make itself as big as possible and try and roll and hit you. It leaves a gap above it though, so you can just swim around it to avoid its spiky regions. You do have to keep an eye out for any dropping spikes though – that can happen during this phase. Right after that, the pufferfish will start hitting into the walls, occasionally exposing its delicate region. Whack it, then try and do so again when it starts spinning. This will trigger the inhale/exhale pattern again, during which it will fire out green fish. Hit one into it to end this battle. Phew! The first phase of this fight is super easy. 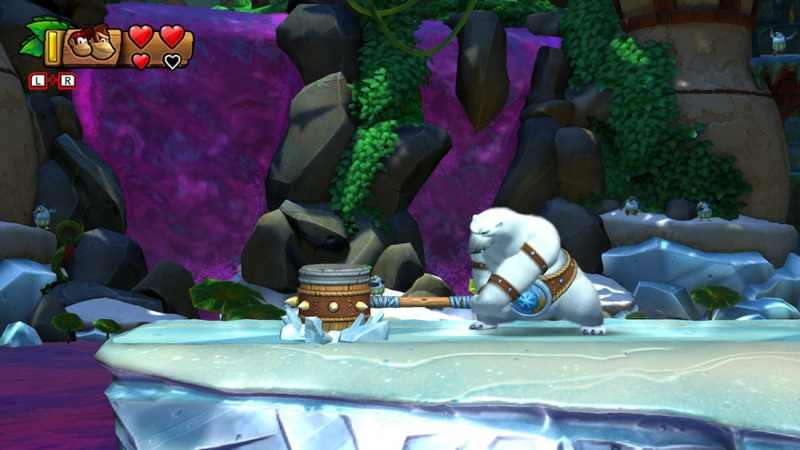 The polar bear will rush at you and try and hit you with its hammer. It's a super slow attack that you can easily avoid, and afterward the hammer will remain stuck in the ground temporarily. Use this as an opportunity to jump on the hammer and then on the enemy's head to damage it. Be careful now though because the bear will leap into the air and try and slam down on you from above. Keep an eye on the top of the screen to try and spot where it will land from. You'll see bits of snow and ice, so don't stand underneath that. Now, the naughty bear will start kicking blocks of ice at you. Keep an eye out for a watermelon bomb frozen in a block of ice, then stomp it to get the bomb. Chuck it at the bear to hurt it. Rinse and repeat these instructions to hit it one more time and you'll enter phase two. You'll now have stacks of blocks to contend with. Jump across them and over the bear when it spins to avoid that attack, then bop on its head when it's dizzy. The bear will then slam down from above again, but this time will fire a sheet of ice at you. Jump over it. This will trigger the ice blocks again, but this time you'll have to jump over them several times until the bear gets dizzy. Bop it on the head then rinse and repeat to get to phase three. 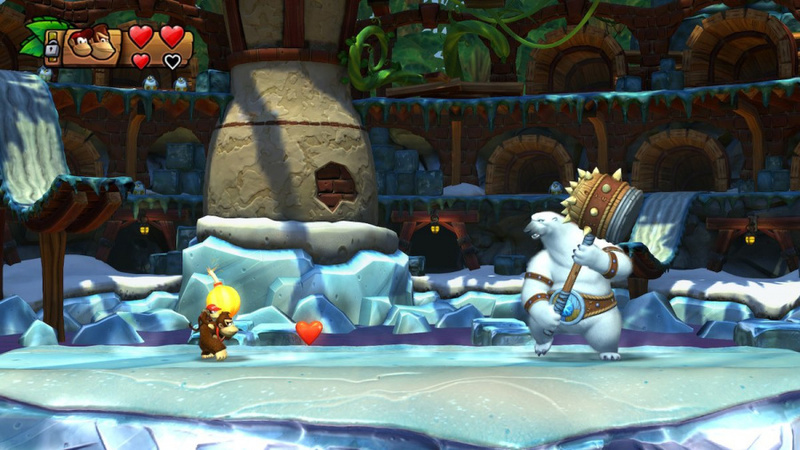 Phase three kicks off with more ice block stacks that the polar bear will kick at you. Find the watermelon bomb and chuck it at the polar bear to hurt it. Now, our fuzzy friend will start whacking spiky shards of ice at you. Just jump over them, but be careful as it will occasionally fake a swing to try and throw off your timing. Ice shards can occasionally move slower than the others too – it's a tricky one. Dodge all of them and the polar bear will once again try and hit you with its hammer, but be careful as this time a gush of ice will fly out of it. Dodge both of these and jump off the hammer to bop it on the head. Be quick as you'll have much less time than before. Rinse and repeat to defeat the bear. 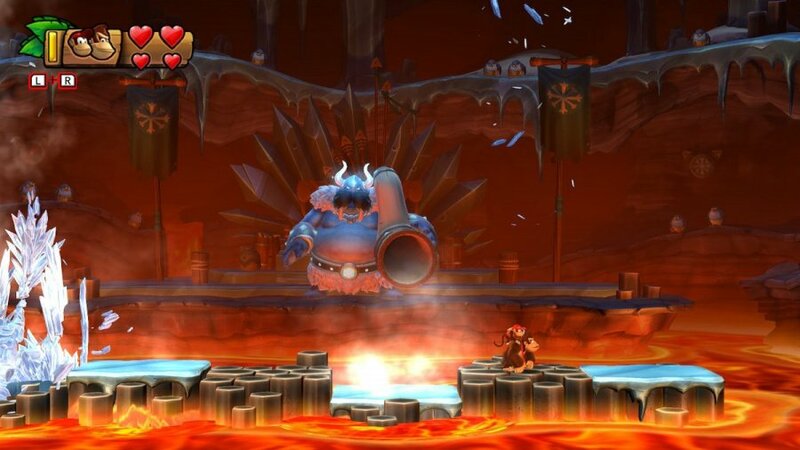 As is befitting an end boss, Volcano Dome is by far the toughest boss battle in the game. It took us many attempts to bring this big bad boss down, as it really involves memorising the attack patterns to a 'T'. Thankfully, you don't need to worry about that as much, as we're going to tell you them now. The first phase is pretty easy. 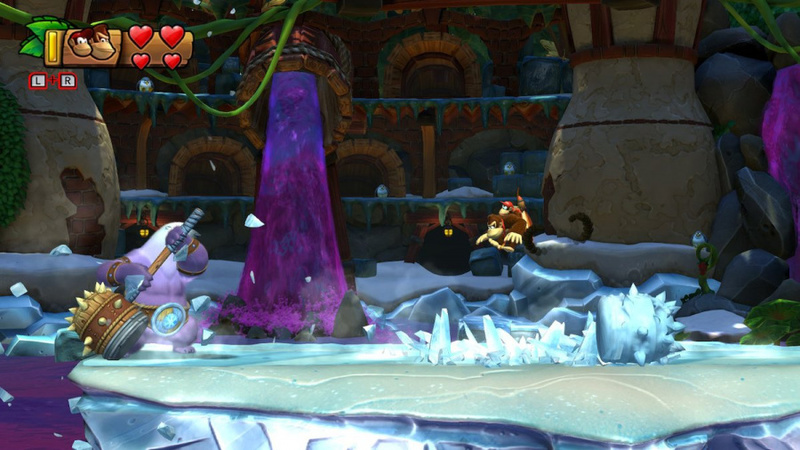 Avoid the spiky ice balls that the boss will chuck at you, then bop a helmet enemy on the head when they're released from the broken ice. Now, you have to try and hit the boss in the background to make it come to you. The boss will try and dodge this though, so wait until it's moved about a bit and it will eventually pause in place. Chuck it directly at the boss during this moment to hit it. Now, the boss will charge at you like a bull three times. During the first phase, its rush is pretty slow, so you shouldn't have any trouble jumping onto its back three times to end phase one. Don't worry if you can't though, as the boss will simply return to the background and repeat the pattern. Keep hitting it until its down. Bear in mind that the boss will try to jump on top of you if you fail to bop it three times during the charging phase. Get well out of the way of where it will land, but also be careful not to fall into the lava. 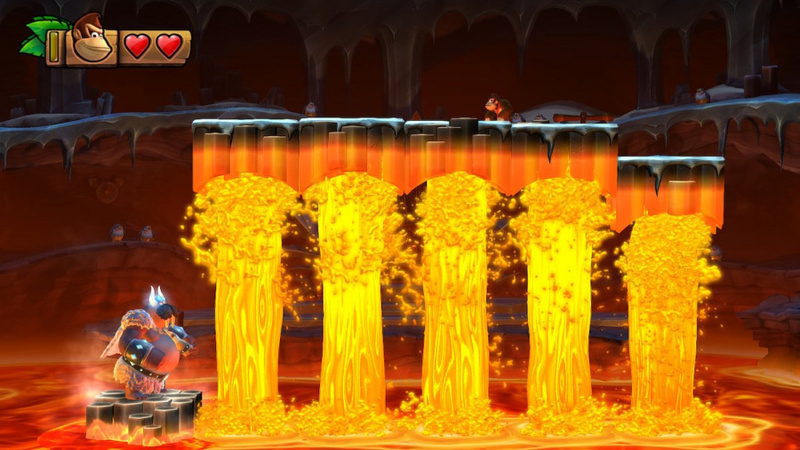 Each time the boss jumps, the platform it jumps from will temporarily sink into the lava. Phase two is largely a retread of phase one, with one notable exception: ice dragons. 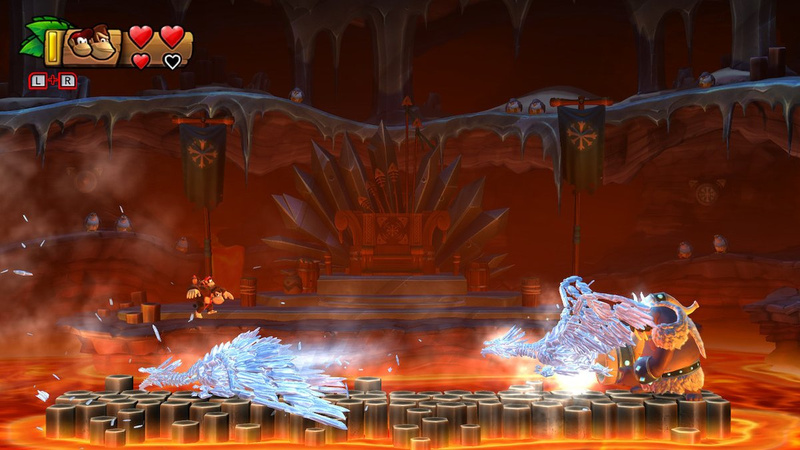 The boss will fire these out at you initially, and whenever they land on a platform they'll cover it in ice. Keep an eye above you and you should see when a dragon is about to land on your platform as ice and snowflakes will appear above it. Don't be there when the dragon lands. Next up is a return to the balls of spiky ice. Dodge them and once again bop on a helmet penguin and chuck it at the boss. Remember to wait until it pauses temporarily to guarantee the hit. Once again, the boss will jump into the foreground and charge at you, though slightly faster than before. Hit it three times or rinse and repeat this section, avoiding its jumps once again, to move onto phase three. This is where the boss battle is at its toughest, so be on your guard. 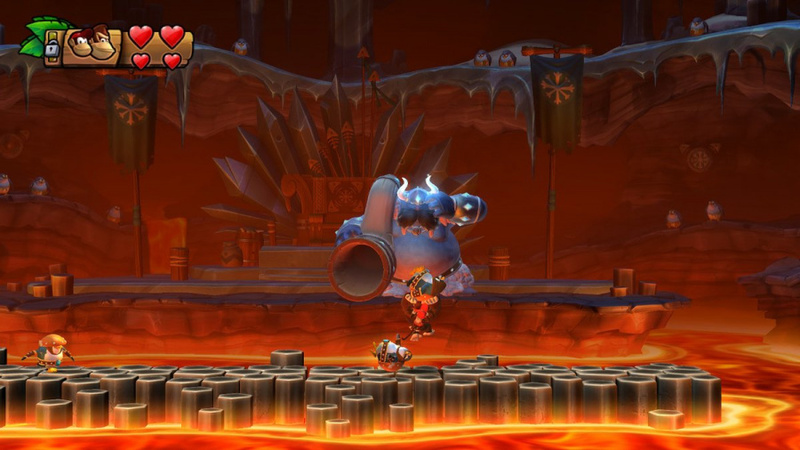 At the beginning of this phase, the boss will cause all of the platforms to rise up and out of the lava, then fall and sink into it. The platforms won't all fall at once though. Make a not of which one falls first, then at the last minute before the platform your standing on falls then jump to the platform that fell first. It should have risen back out of the lava by the time you land. Now, our friend will jump into the background and start firing dragons and ice balls once again. Dodge everything, throw a helmet penguin at it, bop it as it charges. You know the drill by now. Well, except for the fact that the charge is insanely fast this time so be very careful and don't worry if you can't hit it three times. Following this, the boss will raise the platforms once again and they will fall in a different sequence. Do as we suggested above to survive this section, then make your way to the furthest section away from the boss. It will now fire ice dragons at you. This sequence feels very tough the first time you do it, but don't panic – it's easier than it looks. If the dragon has wings, duck under it. If it doesn't, jump over it. The dragons aren't actually as wide as they look, so you don't need a buddy kong to get over them. 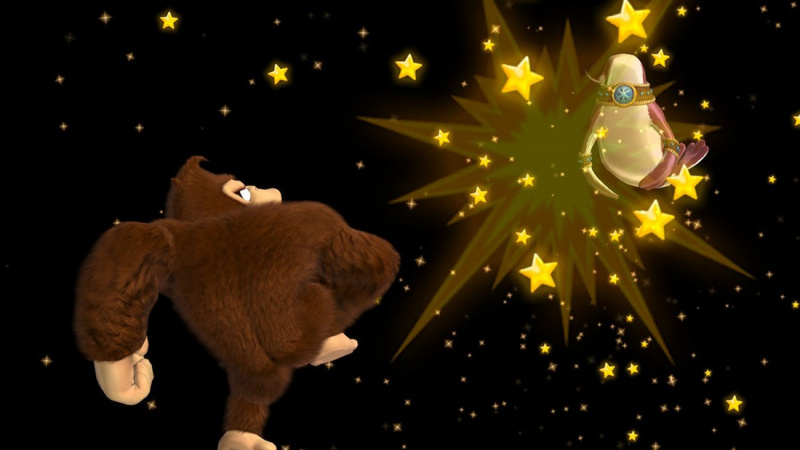 Just a simple big jump from DK will suffice. Now, simply rinse and repeat this as many times as it takes to get that third and final hit on the boss to beat the game. It's a real nightmare, but someone has to do it! It's funny how I was playing this game years ago extolling it's virtues to non Wii U owners who said it was crap, only for these same people now telling me I should buy a switch to play it! Well, maybe you should 😉 It's a great game after all. Funky mode time trials with Funky are worth it in and of itself. That and co-op anywhere and enjoying excellent platforming anywhere. 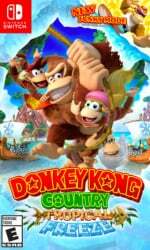 But ya, I played it back on Wii U, and to this very day I have not changed my tune- it was and still is the greatest 2D Platformer I've ever played. I wish bosses were my problem. World 3-4 is insane. Even as Funky. I am just bad at video games. I am bad at these platformer type of games and I can't even get by the first boss. It's frustrating to say the least. I should just stick to RPG's and tactical games. Timing and precision are not my strengths.